Remember getting exciting about 128GB USB flash drives? 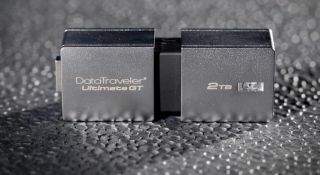 Well, such capacities are utterly pedestrian next to Kingston's new DataTraveler Ultimate GT, which is now shipping in 1TB and 2TB capacities. For many people, that's enough storage space to backup an entire OS drive, Steam library included. Kingston teased these drives at the Consumer Electronics Show a couple of months ago. At the time, the company said they'd be available in February with more information to follow. With just one more day left in the month, Kingston made good on its promise. "We are always striving to create new and better storage solutions to meet our customers’ needs especially in an ever-increasing digital world," said Jean Wong, Flash business manager, Kingston. "With the release of the DataTraveler Ultimate GT, users can push the boundaries of their mobile storage needs and ensure that they have more than enough space to store their video, photos and files in a small form factor." Mr. Wong will have no argument from us there. And as far as tiny USB flash drives go, these are on the smaller side, measuring 75.18 x 27 x 21.02 mm. They're also USB 3.1 drives, albeit Gen 1. That means they have the same speed ceiling as USB 3.0 at up to 5Gbps or 625MB/s (practical speed is more in the neighborhood of 300MB/s), versus up to 10Gbps or 1,250MB/s for USB 3.1 Gen 2 drives. That's the first negative. The other buzz kill is the price. Are you sitting down? And have you swallowed that gulp of coffee or Red Bull? Good—Kingston has both of these drives on sale, with the 1TB going for $942.50 (down from $1,319) and the 2TB for $1,625 (down from $2,273). Oomph! Hey, if price is no object and you're not deterred by the 5Gbps speed ceiling, you can grab either drive here.